Attorneys were recognized during the Hilo Self-Help Center Recognition Awards on Monday, Jan. 8, 2018 for providing free legal information to more than 1,000 people on Hawai‘i Island who sought assistance at the Hilo Courthouse Self-Help Center in 2017. This is the most the Hilo Self-Help Center has ever served in a single year. Forty-seven attorneys were recognized during the Hilo Self-Help Center Recognition Awards. Courtesy photo. The Hilo Self-Help Center was established in July 2012 as part of the Hawai‘i State Judiciary’s commitment to increasing access to justice in the courts. Since opening, more than 4,900 people have been assisted by volunteer attorneys providing legal information on civil matters, such as temporary restraining orders and divorce. These services have been provided at almost no cost to the state. Volunteers were recognized for their service by Hawaii Supreme Court Chief Justice Mark Recktenwald, Third Circuit Chief Judge Greg Nakamura, Chief Court Administrator Lester Oshiro, and Deputy Chief Court Administrators Cheryl Salmo and Dawn West. 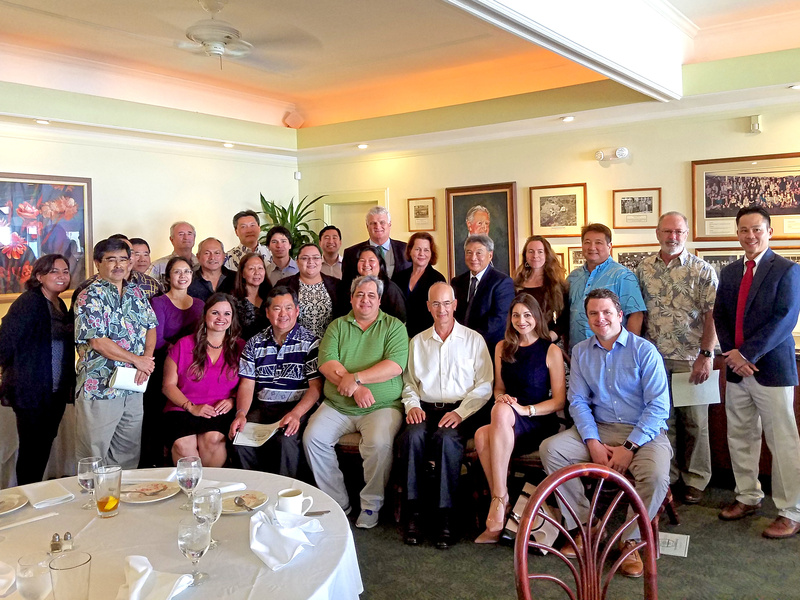 The individual attorneys who were honored are: Francis Alcain, Lincoln Ashida, Chris Bridges, Michael Garbarino, Kenneth Goodenow, Jo Anne Goya, Belinda Hall, Doug Halsted, Paul Hamano, Jill Hasegawa, Ray Hasegawa, Charles Heaukulani, William Heflin, Mahilani Hiatt, Ted Hong, Austin Hsu, Michael Kagami, Haaheo Kahoohalahala, Edith Kawai, Jo Kim, Nelson Kinoshita, Al Konishi, Peter Kubota, Breann Larios, Bruce Larson, Justin Lee, Dwayne Lerma, Shaunda Liu, Jacky Mena, Jeff Ng, Jennifer Ng, Michelle Oishi, Danny Patel, Melody Parker, Christopher Rothfus, Jill Razov, Joy San Buenaventura, Chris Schlueter, Steven Strauss, Andrew Son, Albert Thompson, Sylvia Wan, Molly Ward, Jennifer Wharton, Zachary Wingert, Jay Yoshimoto and Jennifer Zelko-Schlueter. Also acknowledged was AmeriCorps Advocate Katie Kamelamela, who, through the Legal Aid Society of Hawai‘i, organizes the Self-Help Center at the Hilo Courthouse each week. The Chief Justice and Knudsen also thanked the Hawai‘i County Bar Association, the Hawaii State Bar Association, the Legal Aid Society of Hawai‘i, and the Access to Justice Commission for their support of the Judiciary’s efforts to bring self-help services to Hawai‘i residents statewide. Attorneys who would like to become involved with the Hilo or Kona Self-Help Centers are invited to contact the Legal Aid Society of Hawai‘i about the next volunteer attorney training. Information is available online. For more information on the Self-Help Centers, visit the Hawai‘i State Judiciary website and click on the “Self-Help” tab near the top of the page.